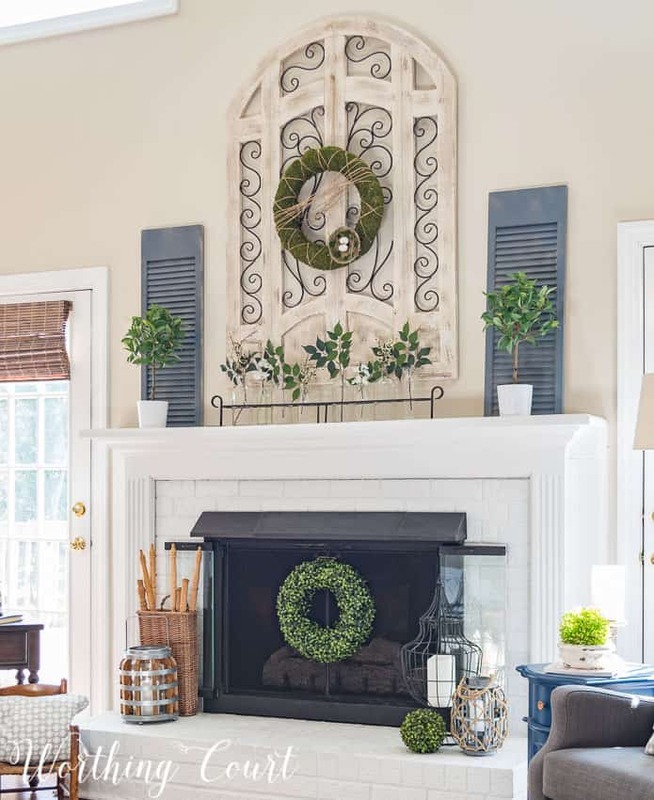 Since our family room is so open to our kitchen and breakfast area, I decided to use the same color scheme on my fireplace that I used on the open shelves in my breakfast area this spring – mainly black, white and green. I get inspired by the craziest things sometimes. See that black metal piece on the mantel with the glass bottles in it? I don’t know what it’s original use was, but I picked that thing up at a thrift store and knew right away what I would do with it! Thus began the hunt for clear glass bottles that would fit in the middle, between the pieces of metal. Luckily I found some at the same thrift store and picked up quite a few more on clearance at a retail store. I still kept my shutters and hanging wood/metal architectural piece to use for the backdrop. Click HERE for a link to where I purchased the architectural piece. I opened up the glass fireplace doors for the photos because they have so much reflection in them. But, that left me with a big ole black hole, which I chose to partially cover with a faux boxwood wreath. Too many wreaths, you think??? I kind of like the look and may rehang the wreath once I close the doors up again. Speaking of wreaths, click HERE for the step-by-step tutorial for making a moss covered wreath just like this one. Easy! I picked up a few vintage spindles at a local barn sale recently and used them to fill a basket on one end of the hearth. On the other end of the hearth, I brought in one of the wire lanterns that I had been using in the planters on my front porch. Now that I’ve completed my spring decorating, I’m ready for the temps to get just a little bit warmer! How about you? Can’t wait for the wreath tutorial!!!! Everything looks great, as usual! The best Spring mantle ever!! Simple yet elegant. Thumbs up! Yay! Very nice! The simple design makes a nice statement! Love all the greenery, simple and fresh! Really love your thrift store find! It’s perfect under your architectural piece. I always have to do a “second tour” of your home to make sure I have not missed anything! Thx for sharing! Looks fresh and ready for spring. 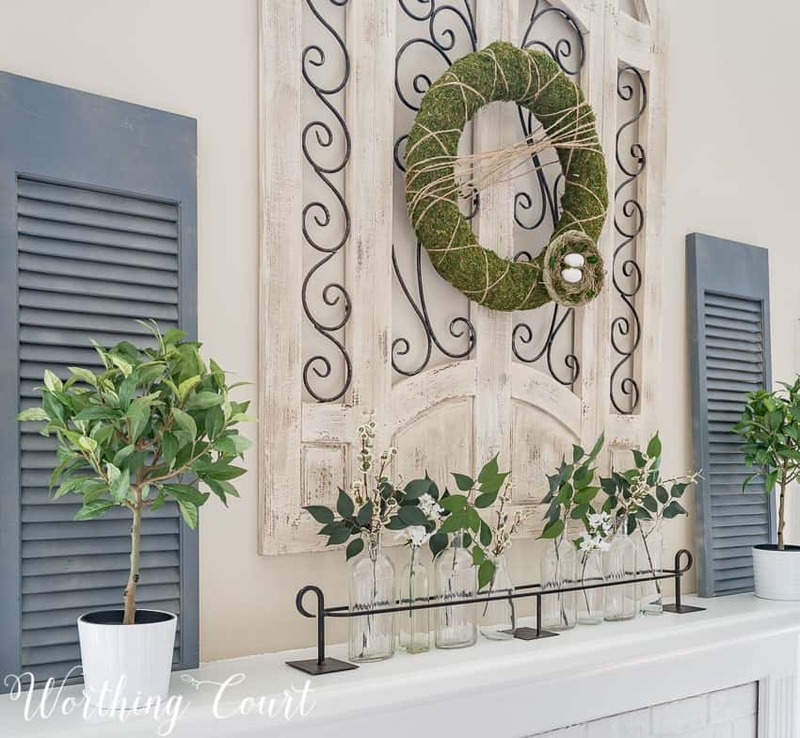 I am a wreath lover and I feel you can never have too many wreaths! I just love how you have a way of combining items that look so go together. You have a beautiful home. I look forward to your posts every morning to start my day.Thanks for sharing. 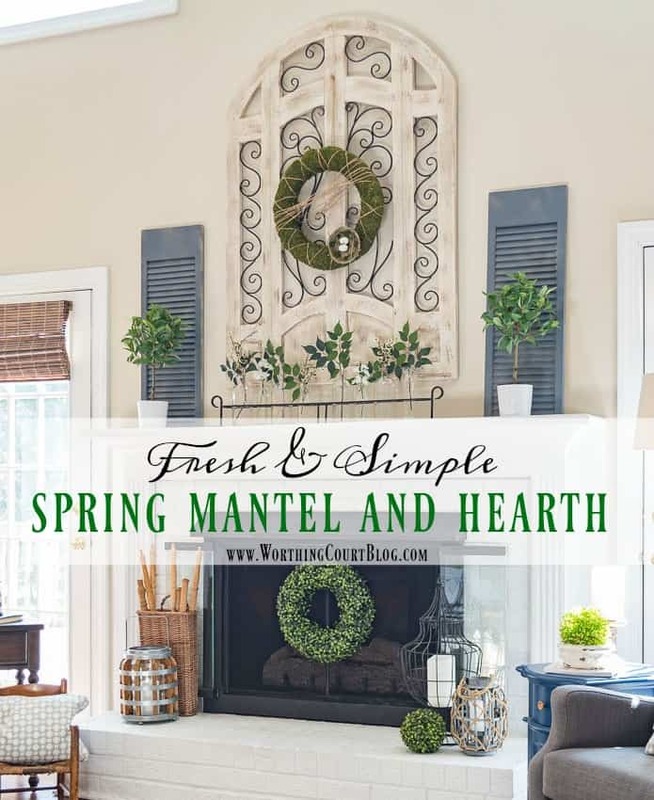 I love your spring mantel and how it complements your kitchen and dining area. 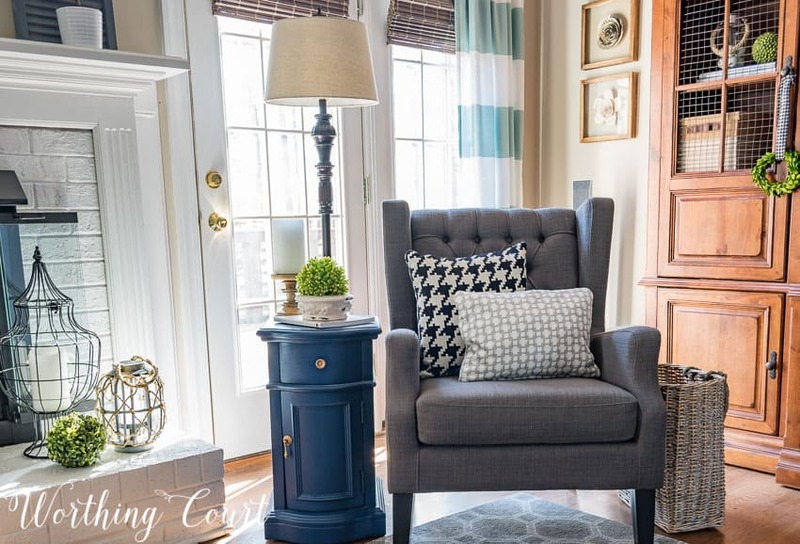 Could you please comment where you purchased the blue end table next to the chair by your mantel? That is exactly what I am l trying to find for my living area. Hi Julie. I found that little table at a local home decor store many years ago. It was originally olive green, but I gave it a makeover with Annie Sloan’s chalkpaint in Napoleonic Blue. Love seeing your subtle changes! There’s nothing wrong with continuing to tweak all through Spring and Summer. I find myself sometimes changing things up just a day before I plan to change them out for the season — that’s why I take photos of my mantle and tabletop decor so I can refer back to arrangements I particularly liked and can recreate next year. Your mantel looks great. I love all the greenery that is in the stores. I have a hard time deciding what to buy. All the wreaths are beautiful also. Love your mantle. Waiting to create the moss wreath. So beautiful! I love your decorating style. I’m going to steal some ideas from you! I’ve always loved how you decorate your mantel and this is no exception. 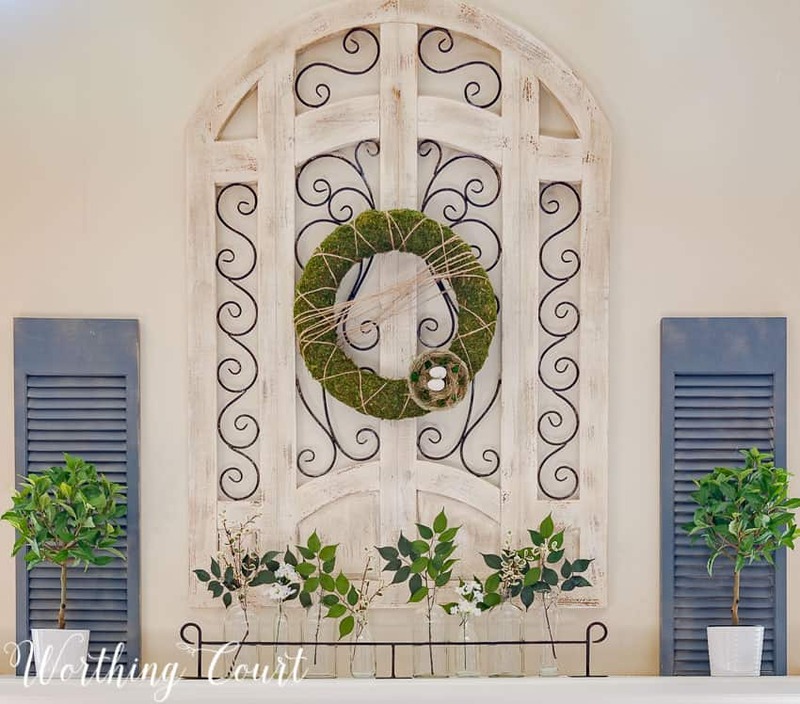 I love the boxwood wreath that you hung in front of your fireplace doors. Really pretty, Suzy. 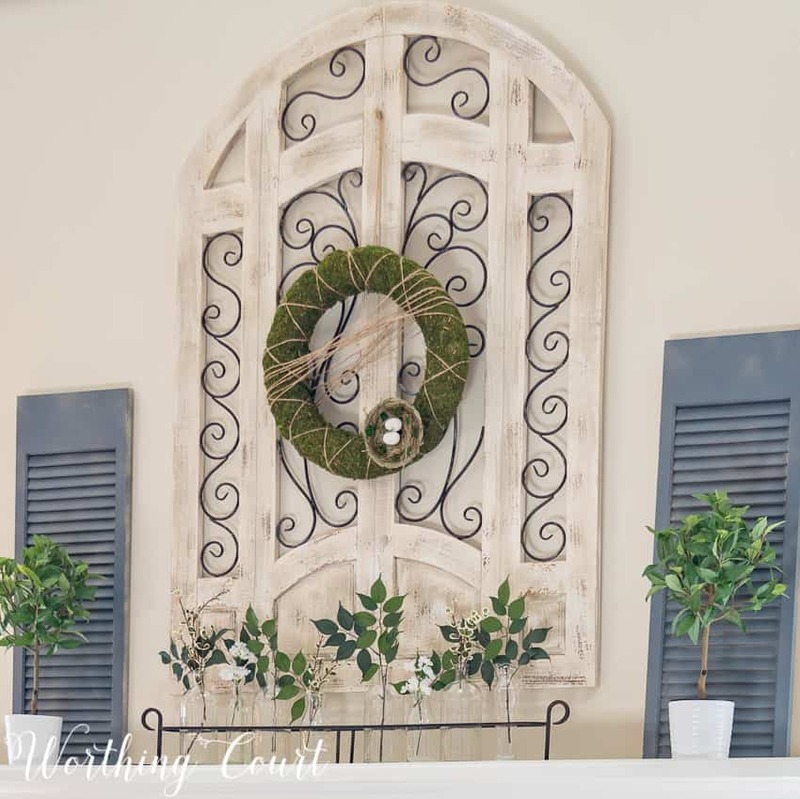 I like both wreaths… but, I think I have a thing for wreaths, too! I’ll have to look at the bottle holder up close on my phone, unless you feel so inclined to add a closeup here (hint, hint, wink, wink!) I think I need to rethink the flowers in the bottles that are on my wall. I got the hint, Julie! LOL I can’t post a picture here in the comments, but if you’ll send a request to worthingcourtblog.com, I’ll send one to you. Correction! Send it to worthingcourtblog@gmail.com . Hi Suzy Your decor is just simply gorgeous! Can you tell me where you got the basket the spindles are in? I have been shopping around for one to put forsythia in and hang on my door! Hi Janet. I found that basket at a local barn sale. I’ve seen similar hanging baskets at World Market, but they aren’t quite as tall. Beautiful room – you are amazing! So, so pretty. I love the understated colors and the various objects are so compatible. Great job! 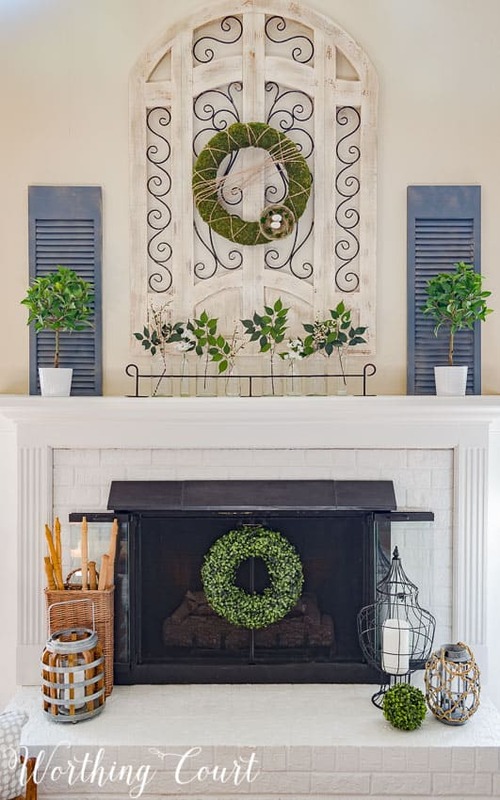 The mantle is beautiful and I love both wreaths. I thought hanging the boxwood in the fireplace opening was genius. It’s not too many wreaths at all. I think it all looks so pretty. Thank you for sharing. A beautiful room and pinned!!! i love the mantel decorating! This is absolutely stunning! I love the rustic farmhouse style with all the greenery! 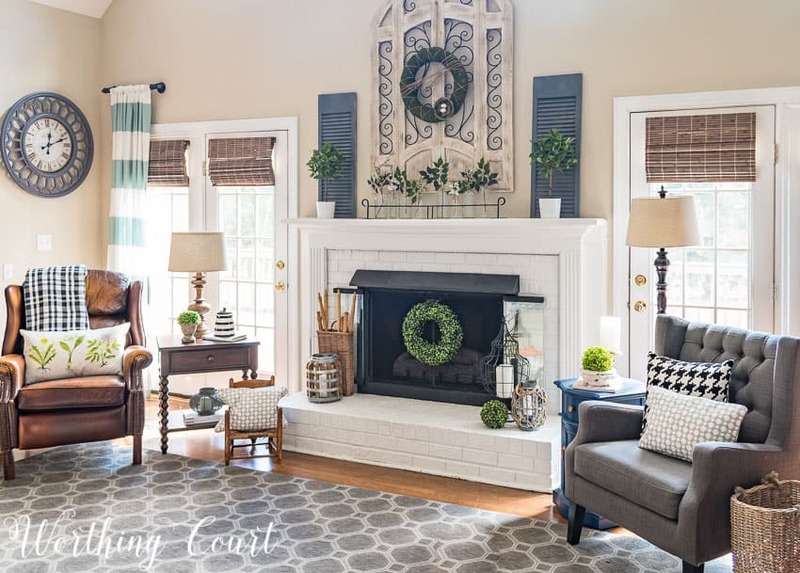 Love spring mantle and refresh. Thanks for sharing at the Inspiration Spotlight party. Pinned & shared. Suzy, you always have such beautiful seasonal decor for your mantel and hearth. Your spring decor is stunning. Thank you for sharing with us at Snickerdoodle. We’ll be featuring this at today’s party. Hope to see you there! Beautiful ! So simple but make a big impact ! This is going to be a good inspiration for my spring decor. Thank you for sharing ! Beautiful spring d! It’s amazing what a difference small changes can make! 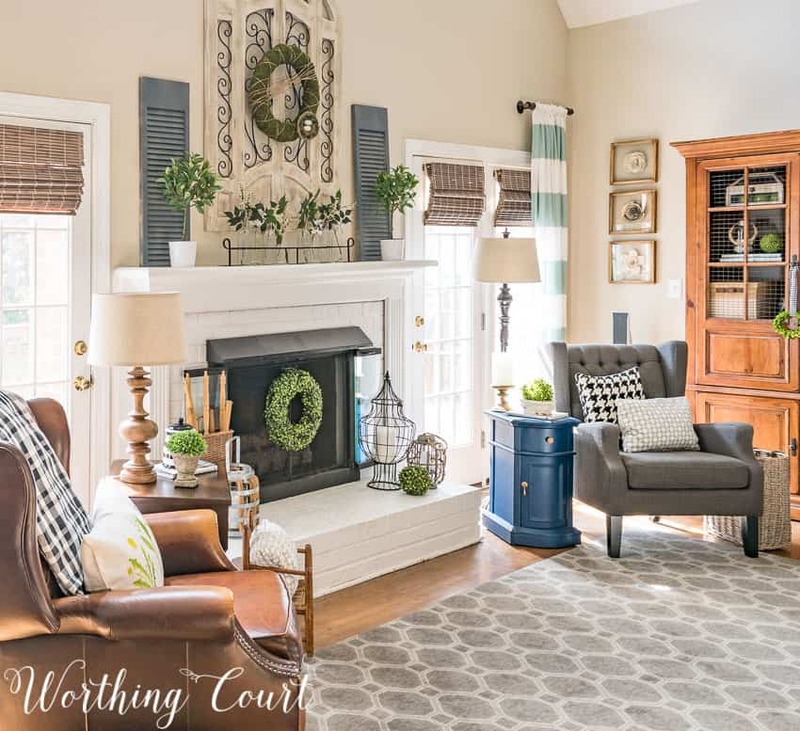 I love the wood and metal arched piece over your fireplace. Where did you get it? Love your style and taste in decorating. I really like your style and your deco ideas!! A lot of the ideas are cost effective!! I’m new to your blog. 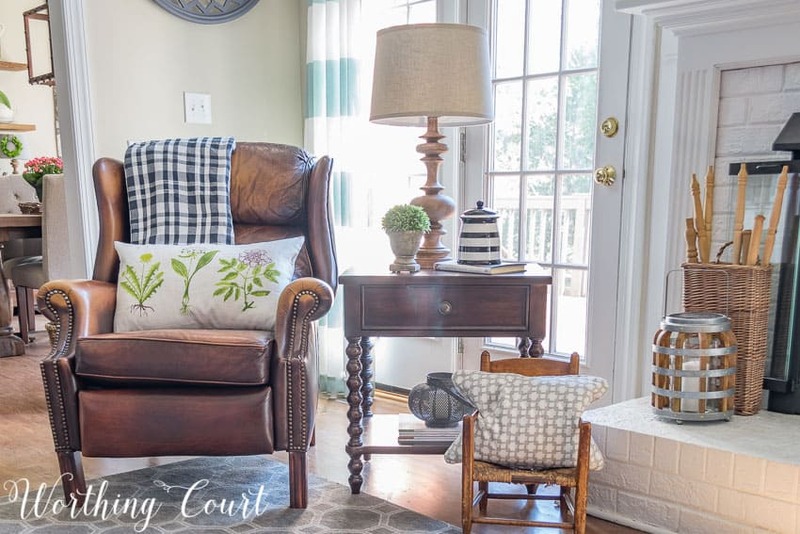 I am so inspired by your simple decor and use of thrifty items. I really like the fact that you aren’t showing us a bunch of new things that you went out and bought from an expensive retailer that cannot be mentioned here. The most exciting thing for me is that I just picked up a “candle cage” as I like to call it, very similar to yours on your hearth. I paid $5 for it from my local mom swap site! Your ideas are so fresh and most importantly, REALISTIC!! Thank you for sharing your down to Earth style and great hints!